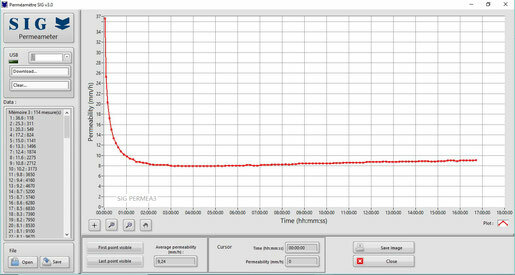 The PERMEA3 permeameter is maintaining a constant water level in an auger hole, bored at the desired depth of study. The device measures the flow rate of water into the soil. The hydraulic conductivity or permeability K is calculated and recorded for each infiltration cycle. Once a steady-state water flow is attained, the saturation phase is done, and the Kfs or Ksat (K at saturation) can be determined. 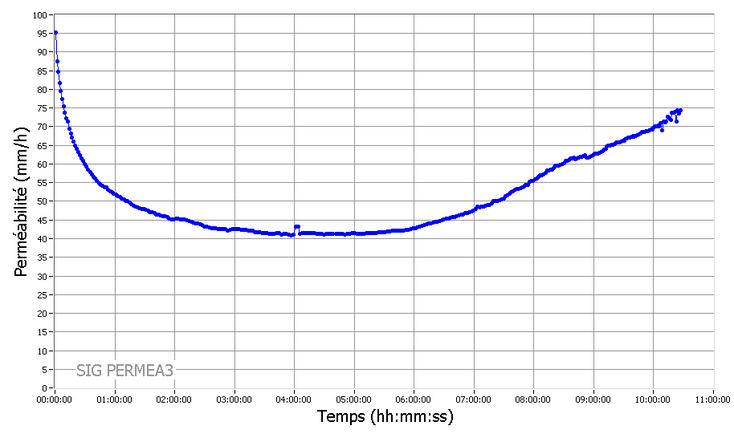 The graphs K versus time given by the PERMEA application can be easily interpreted integrating the environmental factors of the site of study. The PERMEA3 calculations uses the Porchet equation. The Porchet equation is an alternative of the Glover equation, recommended for the Health departments, On-Site Water Protection Branches, licenced soil scientists, licensed geologists, or engineers in waste water. Location and depths of the auger holes must be carefully selected to represent the proposed, or suggested, dispersal volume and area. A pedological log and correlated interpretation need to be assessed in order to understand the values of the hydraulic conductivity. When several horizons are present, it may be appropriate to conduct measurements in single horizons. The hand auger hole must be performed at the desired depth of determination of the hydraulic conductivity. The hole must be scarified to prevent smoothing of the wall, and clogging of the hole. The variability in the soil types, the landscape morphology, and the position of the considered project have to be taken into account to position the tests on the drainfield, and determine the numbers of tests. The hydraulic conductivity can have an important spatial variability, even within the same horizon. So it is important to perform several tests to compare and estimate the KSAT. 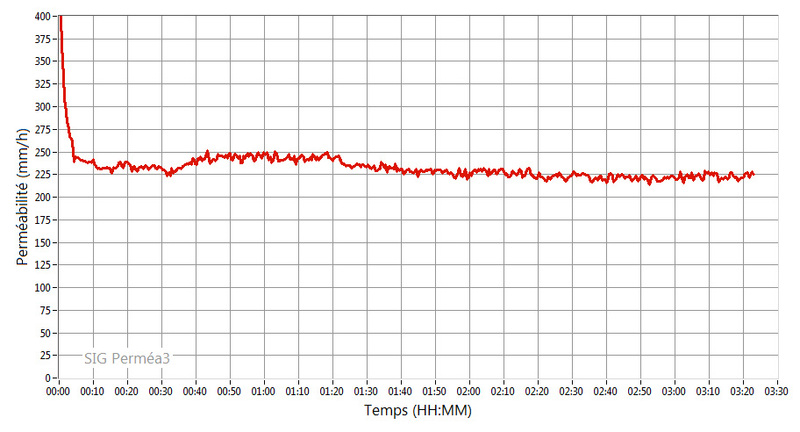 In the same field, within the same sandy horizon, the KSAT shows a variation from 60 to 225 mm/h. The saturation is very rapid, within one hour. The continuous recording of the value of K shows the evolution with time and illustrates the saturation of the soil. The KSAT is only determined by the trained person. 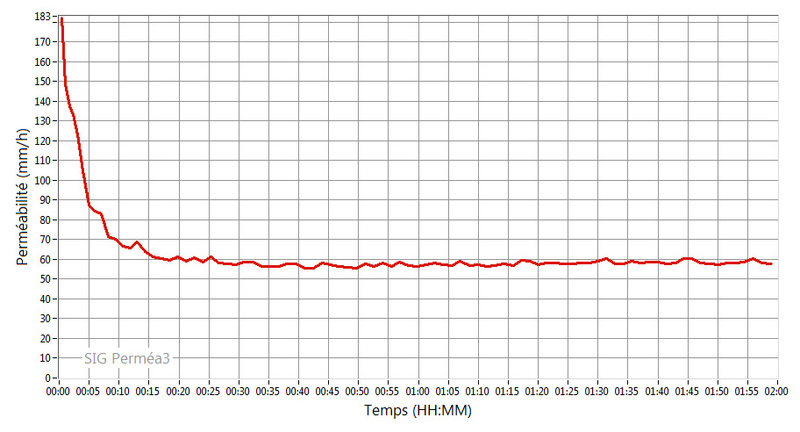 The graphs show also that the topography or the slope gradient can have an incidence on the hydraulic conductivity. It has been observed that in fields of high slope gradients, the hydraulic conductivity will tend to increase with the time. 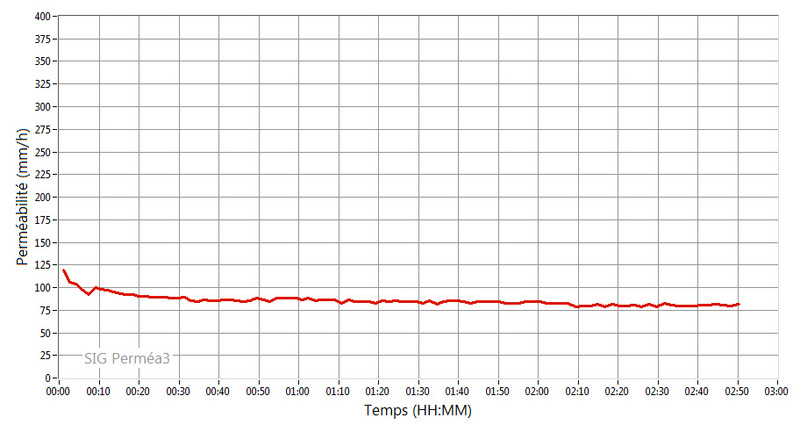 A typical graph of a steep slope environment, with K increasing after more than 5 hours of infiltration test.